Experience the adventure of a lifetime in the Dominican Republic’s best kept secret and natural wonder, the Waterfalls of Rio de Damajagua. Begin your journey with a 40-minute hike through beautiful landscapes to the first of several breathtaking waterfalls, where you can slide into a fresh, sparkling pool of mountain water waiting down below. Each waterfall and pool comes with its very own personality, and you’ll soon find yourself celebrating with every waterfall you conquer. This thrilling adventure has it all; from hiking trails with breathtaking scenery, canyoneering through narrow passages, sliding down natural water slides, and swimming through caverns leaving you with memories never to be forgotten. Feel the adrenaline from start to finish as you ride a giant 6x6 Mega Tiger Truck and discover the waterfalls of Damajagua. See the curves and carvings that has been etched into 27 limestone waterfalls by mother nature. You’ll be able to experience 7 of these majestic waterfalls first-hand as you slide into the refreshing natural lagoon. Climb up, Clip on and get ready for some serious zip lining! But before you do, you’ll be given training at the training center with highly skilled zip lining guides. Six platforms of cable will span out over the Mahogany trees, rich farmland and picturesque mountain views. Tour guides will take you through every step of the way of each feature, ensuring your safety at all times. This is a must for those that seek adrenaline. A triple adventure packed with excitement, adrenaline and unforgettable moments for all ages. Friendly dolphins will welcome you with open “fins” for a hug and a kiss that will make you fall in love with their impressive nature and skills. When it comes to hilarious tricks and having fun it is hard to compete with the Patagonian sea lions better known as the “clowns of the seas”. You will be able to pet, play and feed these incredible mammals creating memories to last forever. Continue the exciting experience by getting into snorkeling gear and enjoying a wonderful adventure by feeding, touching and snorkeling with the sharks. On your free time, visit the tropical rain forest to meet macaws, toucans and everyone’s favorite the love birds, with the opportunity to feed them in your hands and over your head. Experience the ultimate active adventure in the Dominican Republic where you will take a back road journey on our mega trucks, go zip lining, horseback riding and finally enjoy a delicious lunch. Journey through quaint villages in the countryside of Puerto Plata on our Mega Trucks, designed to take you to places that regular trucks find difficult to reach. These country roads lead to our wonderful nature adventure park. See nature from a different perspective as you go on a daring aerial adventure and swing across a series of 7 zip lines with amazing birds-eye views. Swap your harness and pulleys for a saddle as our well-trained island horses take you on a unforgettable horseback mountain ride. Indulge in a tasty lunch of local Dominican cuisines and drinks at the adventure park. Don’t leave before you experience a walk through our fruit and fauna gardens. Meet our wonderful squirrel monkeys at Monkey Jungle! We invite you to enter a tropical jungle forest and listen to the sounds of nature while keeping a look out for the cute little squirrel monkeys. Our special trained staff will give you a fruit plate in which you can offer food to the squirrel monkeys. Be careful though as they are cheeky, friendly and fun and love all shiny objects. An awesome opportunity to get up close with some lovable fun little monkeys. Next, we will take you to see a typical countryside home where time has stood still. See and experience how locals really live without running water or electricity, learn about the history and culture of this beautiful Caribbean island and discover traditional customs, sample organic countryside coffee. 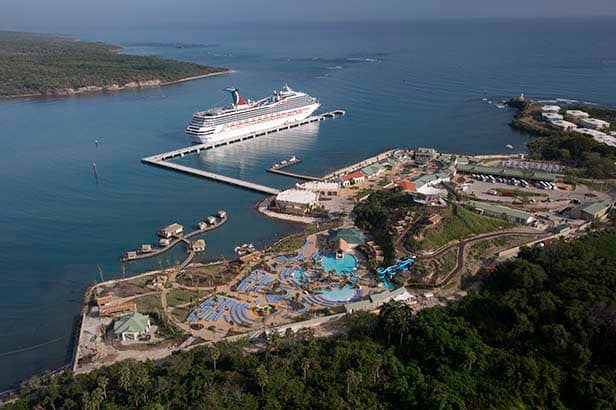 The Amber Cove port is like many newer ports that have been created by the cruise industry. They have been created as a completely self contained resort area. To see the city and culture you will need to leave the port area. There is shopping and food within in the port. Amber Cove does have access to water slides, beach, and lounge areas. Since this is a new port for the Senior Trip (and myself), the extent of non-shore excursion exploration may be limited. From Carnival's website: Water enthusiast have their choice of nearby beachfront resort experiences—think beach lounger, beach umbrella and chair-side service—along with the simplicity of waterside hammocks and major pool action on-site at Aqua Zone (complimentary for cruisers). This resort-style pool has a swim-up bar, water slides, a lazy river and plenty of lounge chairs for kicking back. From the Dolphin Discovery area, head to the Sea Lion Show, included for Carnival guests, where you and other Cruise guests laugh out loud as you watch the hilarious antics of the sea lions during the 20-minute show. Get off the beaten path to see the sites of Grand Turk on the most unique type of personal transportation today - on a Segway. You'll hit the road and the beach on this fun tour. Take a short van ride from the cruise center to the starting point at the beginning of beautiful historic Grand Turk. Here you'll meet your guide and will be given instructions on how to control your personal Segway. You'll be surprised how quickly you get the hang of it and how fun it is to ride. Once you've mastered the Segway, set out to explore and experience historic Grand Turk. On your tour you will see picturesque Duke and Front Streets, famous for the old Bermudian-style architecture, historic churches, old cannons and buildings made from old ships. Because you are on the Segway, you will have the opportunity to venture into some of the smaller middle roads where regular bus tours cannot go to get a sense of the heart and culture of people of Grand Turk. For an added thrill you'll have the opportunity to ride your Segway on the pristine white beaches of Grand Turk and stop to view the turquoise water. Throughout your tour, your guide will enlighten you with the rich history of the island on several stops during the tour including viewing the Salt Ponds and learn the rich history of the Salt Raking days. On your return to the cruise center you’ll also have the opportunity to view the Friendship Capsule, a replica of the original space capsule that splashed down off the coast of Grand Turk in 1962. 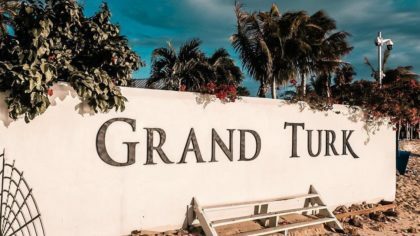 This is truly a unique and fun way to experience Grand Turk. This is the ideal SUP experience for both first time paddle boarders or the more experienced. Learn basic water awareness, proper SUP stance and paddle usage, and how to maneuver your board from experienced, patient instructors. After perfecting your technique, paddle and glide along the coast for a unique point view of the spectacular scenery of Grand Turk. As you paddle, your guides enlighten you about the nature you encounter and the rich history of the island's coastal buildings. A beach and snorkel break will keep you cool during your trip. After your tour, return by shuttle to the cruise center. Spend an afternoon embracing your outdoor spirit on this fun-filled horseback adventure! On this excursion you will start with a bus ride along the coast and across to the other side of the island. Cruise by Governor’s Beach, one of Grand Turk’s natural Salinas and Cockburn Town, the capital of the Turks & Caicos Islands. Arrive at the Grand Turk historic lighthouse where your tour begins. Mount your horse and go for a leisurely walk along picturesque island trails. Take in the view of the crystal clear Atlantic Ocean. Dismount so your guides can unsaddle the horses to prepare them for the swim. Remount your horse, sitting with a halter/water pad, and ride into the sea for the experience of a lifetime! Then it’s beach time at the Reef Shark Bar & Grill! Lounge on one of the longest white sand beaches in Grand Turk. Take a dip in the warm Caribbean Sea. Jam to the rhythms of Caribbean music. Relax in a complimentary beach chair or hammock and play a match of volleyball before returning to the ship by shuttle or at your leisure with a 5-7 minute stroll along the beach. Take your snorkeling experience to the next level. Get up close and personal with an array of colorful tropical fish as you dive into a one-of-a-kind power snorkeling adventure. Discover incredible views hidden just below the water´s surface as your sea-scooter glides you past sea fans, coral reefs and diverse amazing marine life. Glide near the surface and dive down to take a closer look at what the crystal-clear waters of the Turks and Caicos Islands have to offer you. No tour is complete without a visit to a private island where you will see stingrays at play. Take this chance to interact with these wonderful creatures in their natural habitat if you’re feeling adventurous. Your crew will dive for live conch and demonstrate the art of cleaning this local delicacy while you sink your toes into the warm, silky sand. Make sure to grab a drink of delicious rum punch, shaken not stirred, to complete this ultimate tour for thrill seekers. This tour includes snorkeling, power snorkel, a visit to a secluded beach on a private island, conch demonstration & tasting and rum punch. ​Experience a great combination of sailing aboard one of the most beautiful catamarans in the Caribbean, a white sand beach and extraordinary snorkeling. You will have a magical experience sailing along the crystal clear, turquoise waters aboard the spacious catamaran. Stop to snorkel in an underwater coral reef paradise teeming with bright tropical fish. After snorkeling, sip on a rum punch as you sail along the coast to a beautiful beach. Take the time to sink your toes into the soft, white sand of this private beach. Enjoy a swim, relax on a float, or discover the treasures of the island. The port at Grand Turk has a resort style atmosphere with access to pools and other activities that will have additional costs. It is easy and safe to leave the port and explore. There are several historical sites on the island and opportunities to leave the business of the port and take walks on the beach.